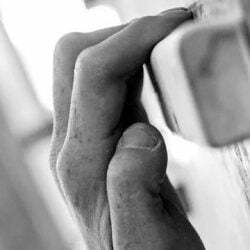 The hangboard is perhaps the best tool for developing finger strength in climbers. 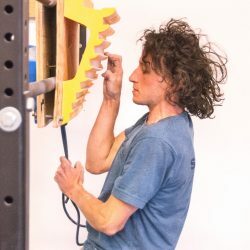 Unfortunately, it is too often “over-sold” by manufacturers as a one-stop training device for all climbing movement. When your desire is stronger fingers, let that be your goal; don’t be fooled into trying to get a pump or do a bunch of pull-ups. A hangboard should be selected based on its variety of both open-hand and closed-grip holds. The best boards have 2-3 sizes of each hold, and these should feel like they fit you. A nice jug is helpful, too. Don’t be fooled by tons of pockets, slopers, pinches, and such…these are sales flair more than being of actual use to the climber. Because this is the most direct and intense finger training you’ll do, a good warm-up is paramount. The warm-up should be at least 10 minutes in length, starting with general upper body movements (easy climbing, weights, or body-weight exercises), then some hand exercises such as wrist curls or grippers, and finally some easy hangs on big holds. It is important and informational to keep records of your training. Maintain a hangboard log to monitor progress and assure continuity of your training. If you have never trained on a board before, there is no need to get fancy with your grip positions or your workout format. Save complicating this stuff for when you start to plateau. Work slowly into this training, taking a few sessions of easy hanging to build up to the hard stuff. Eventually, you’ll work toward holding 3-4 different positions, up to 4 sets each. Hold each position straight-armed for 4-10 seconds. 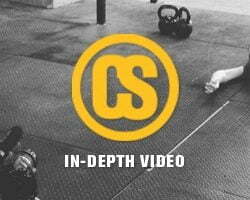 If you can hold all four sets for 10 seconds each, the position is probably too easy. If you can’t hold a position for four seconds it might pose an injury risk. putting feet on a chair, bucket, etc. The goal is to gain strength, not to get pumped! Rest 30 seconds to one minute between sets. At first it may seem easy, but as you advance, you’ll feel the need for this rest. Remember that fatigue has no place in strength training. The focus of a workout should address each climber’s weaknesses or be congruent with his climbing goals. Keep this in mind if working out with friends. It is neither necessary nor possible to train every potential hold position. In general you should focus on three main positions: full crimp, half crimp, and open hand. These can be trained at various different sizes during a workout. Pinch grips, though rare, should be considered if you climb on them regularly. I recommend “pinch blocks” for this training rather than using a hangboard. Improvement takes time. 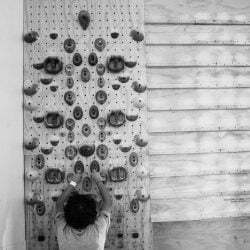 Plan to train no more than 2 times per week on the hangboard, and expect results to take many weeks. Improvements will only continue for a short time before a rest cycle needs to occur and a new training build started. If this doesn’t happen, expect injury. I often tell the climbers in our programs to look at this like farming: plant the seeds, water regularly, and wait – there’s no hurrying strength.